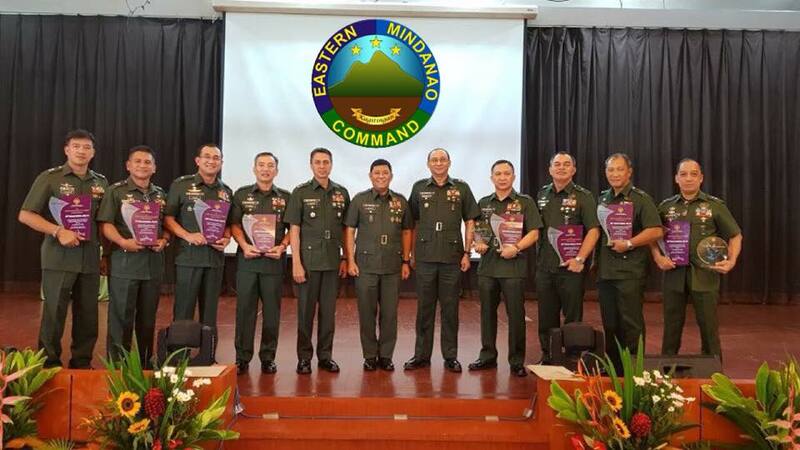 NSFA, Panacan, Davao City - Various units under Eastern Mindanao Command received the "Gawad sa Kapayaan" Award from General Carlito G Galvez, the Chief of Staff Armed Forces of the Philippines for their major contribution in the overall effort of maintaining peace and security in Eastern Mindanao. The award was given on August 8, 2018, during the Command Conference at AFP General Headquarters, Camp Emilio Aguinaldo, Quezon City, that was also attended by Lt. Gen. Benjamin R. Madrigal, Jr., the Commander of Eastern Mindanao Command, AFP. 100st Infantry Brigade, 10th Infantry Division, Philippine Army (10th ID, PA) represented by its former Commander, Brigadier General Bernard Erwin Neri, and 701st Infantry Brigade, 7th Infantry Division, Philippine Army (7th ID, PA) represented by its present Commander, Brigadier General Reuben S. Basiao for maintaining peace and order by dismantling NPA formation and political apparatus in the areas transcending boundaries of Davao Oriental and Compostela Valley. For maintaining peace and security and for dismantling NPA units in Agusan Sur, a Kapayapaan Award was likewise given to 401st Infantry Brigade, 4th Infantry Division, Philippine Army (4th ID, PA) represented by its Commander Brigadier General Andres Centino and 26th Infantry Battalion, 4th ID, PA under Lt. Col. Rommel S. Pagayun. The 1002nd Infantry Brigade, 10th Infantry Division, Philippine Army represented by Brigadier General Roberto Ancan, 1003rd Infantry Brigade, 10th ID, PA represented by Brigadier General Ernesto C. Torres Jr., and 3rd Infantry Battalion, 7ID, PA were also conferred with the award for their effort in clearing the boundary of Davao City and Davao Del Sur from NPA formation and underground organizations.